After spending two weeks in Michigan with friends and family for the holidays I came back to Chicago feeling refreshed and ready to take on 2014. I miss the luxury of driving everywhere and not hearing emergency vehicle sirens 24/7, but I love city life and it feels good to be home. The weather in Grand Rapids was chilly but nothing compared to this polar vortex we're experiencing in Chicago right now. With a Starbucks in hand and faux fur coat to keep me warm I almost forgot how cold my toes were for this outfit post ("almost" being the key word in this sentence). 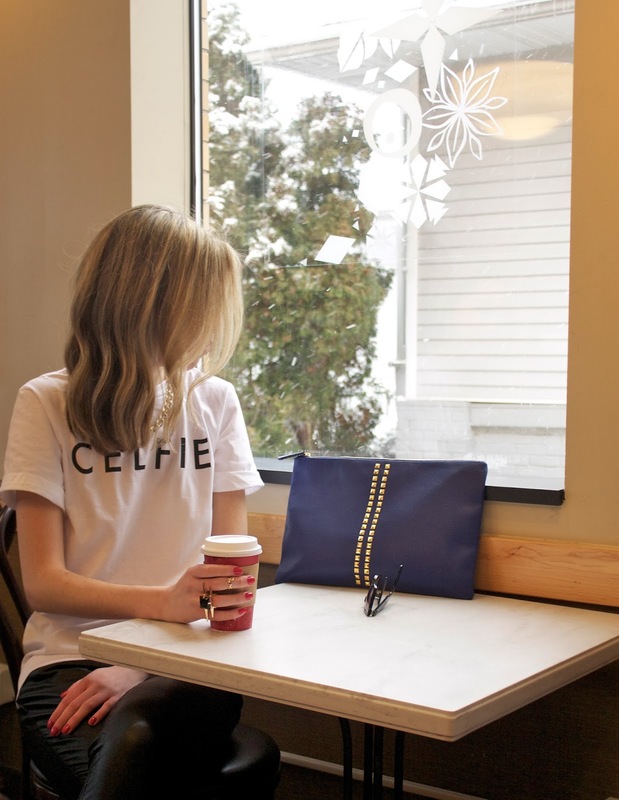 Check out WhatRUWearing next week for details on how you could win this Celfie t-shirt! I love this clutch! Great post! I'm LOVING that clutch too! Great color! love this look - you are so glam down to the very last detail! Love this look! The coat and the pants are such a great way to dress up a tee - although I don't know how you survived outside in open toed shoes!